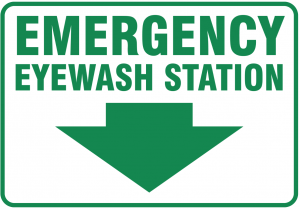 For companies maintaining or considering emergency shower and eyewash stations, there are two key standards to remember. 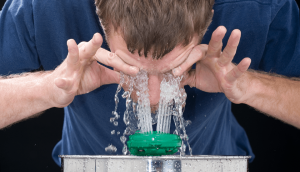 The ANSI/ISEA Z358.1-2014 American National Standard for Emergency Eyewash and Shower Equipment is an essential resource—visit ISEA’s www.safetyequipment.org website to order it. This important consensus standard outlines the minimum equipment performance criteria for this equipment. It specifies flow rates, water temperature delivery, testing, and much more. The Z358.1-2014 standard also directs that the water temperature delivered to this equipment be “tepid,” which is defined as being between 60 degrees and 100 degrees Fahrenheit, so that the affected worker will be able to withstand the continuous flow for 15 minutes without the risk of scalding or hypothermia. Self-contained (gravity-fed) showers must be visually checked weekly to determine whether the flushing fluid needs to be changed or replenished, and they must be maintained according to the manufacturer’s instructions. All emergency showers must be inspected annually to make sure they meet the ANSI Z358.1-2014 performance requirements.